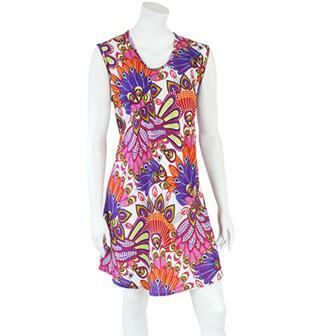 Our dresses section incorporates a great selection of fabrics, colours and styles. 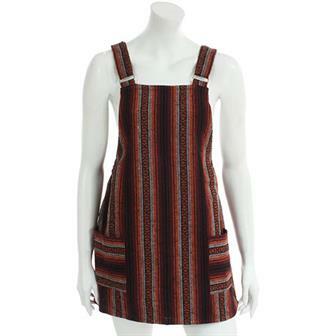 Great for summer parties and festivals, check out our great range for finding a dress! 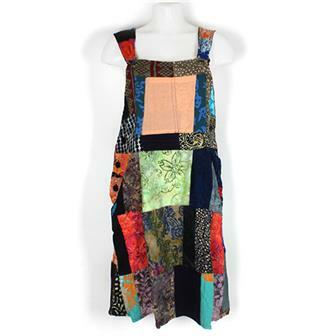 Half dress, half dungarees, all perfectly patchwork! These head-turning beauties are our patchwork twist on the return of a 90's classic. Perfect for rocking out on the festival field or chilling out at the park, each features those classic adjustable button clip fasteners, three side buttons and a front pocket. 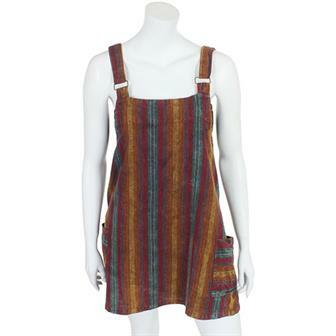 These lovely heavy cotton pinafore dresses are available in a selection of rich colours. Each one is finished with polished coconut buttons. 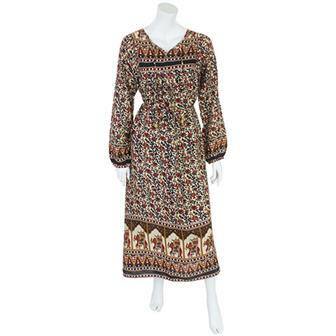 These elegant, long dresses are made using traditional Indian bedspread material. 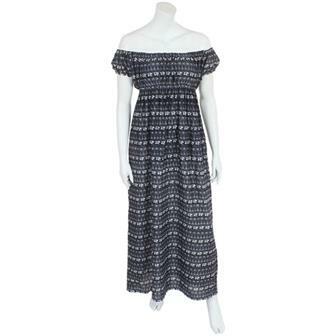 With their elbow length sleeves and long, flowing style, they are ideal for a summer soiree! These elegant, long dresses are made using traditional Indian bedspread material. Sleeveless and flowing, they are ideal for a summer soiree! Massive summertime vibes are provided by this light silken feeling dress. This midi dress features a wrap-over cut which is secured using ties at waist height and a glorious frilled bottom hem line. 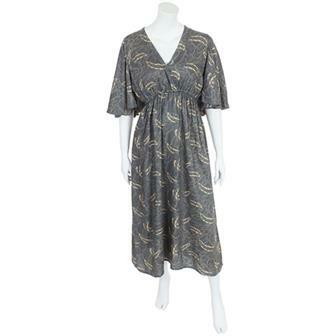 These elegant, 60's styled maxi dresses are produced in a delightful feather print pattern. Each one of these stylish little numbers is made from silken feeling rayon and has a wrap over style bust and drawstring waist. 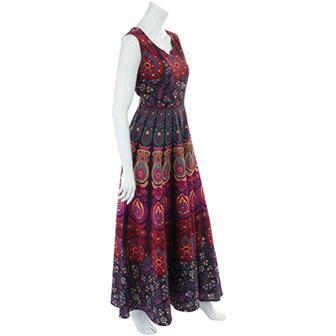 Beautiful maxi length dress in a floral elephant pattern from India. 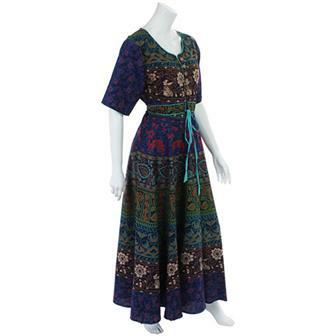 This cotton dress has long sleeves with elasticated hems, drawstrings on the neckline and around the back to tie under the bust so the garment can be worn figure hugging or loose and comfy. 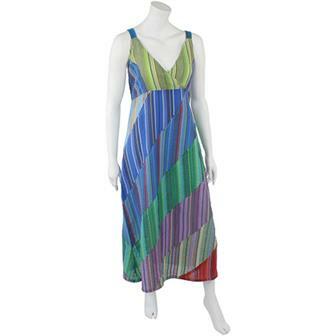 These long V-necked dresses are made from strips of colourful and lightweight seersucker material arranged in a striking diagonal pattern. 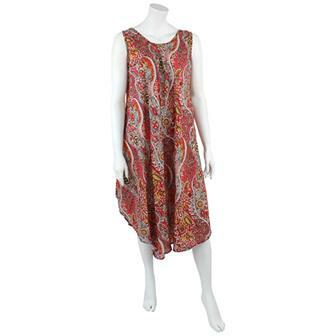 Featuring a wonderful, eye catching paisley pattern in three different colours, these fantastic, flowing long dresses are perfect for summery parties and festivals. 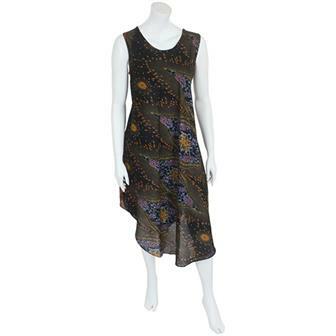 Printed in a busy butterfly pattern this elegantly shaped rayon dress has a gathered elasticated back and an asymmetrical pocket. 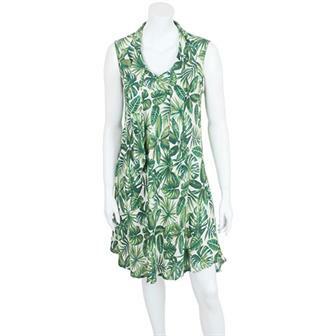 Made in our super summery and bright Tropical material, these sizzling swing dresses make for fantastic party wear. 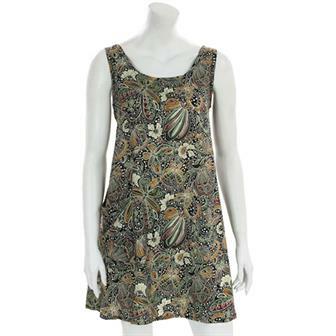 These sizzling 60's style, above-the-knee dresses are made in our wonderful busy jungle leaf print fabric. 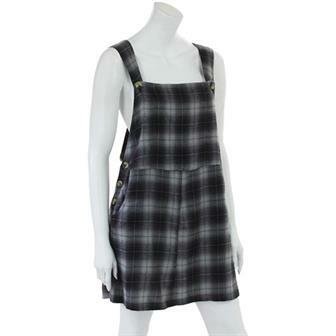 Each dress has ties around the collar for you to add a bow, a tie or elegantly drape down. 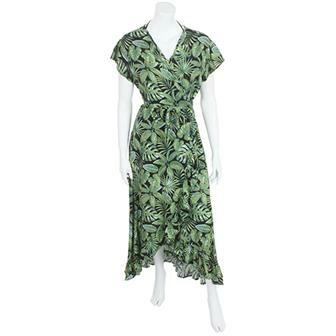 Simple elegant cut dress with a shallow v-neck and drawstring waist in a busy butterfly print, this rayon summer dress is perfect for chilling in the garden.